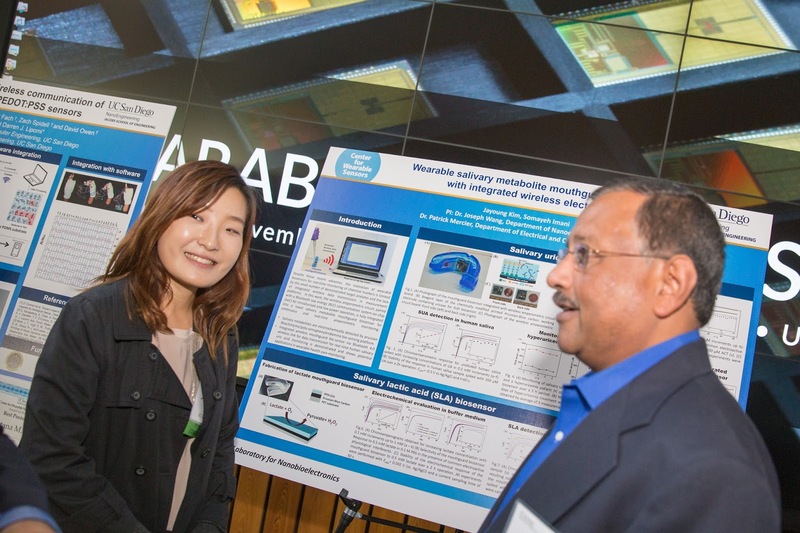 Partners from industry including executives from the Center for Wearable Sensor's newest member companies Dexcom and Sabic interacted with UC San Diego faculty and students. 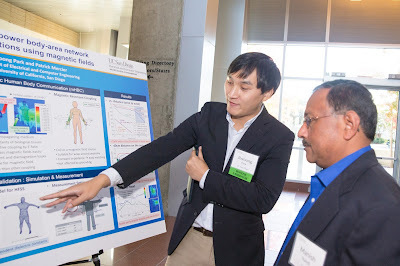 Attendees learned about some of the latest exciting research projects in the Center for Wearable Sensors ranging from skin-like electronics to smartphone-based biosensors for portable and personalized healthcare. 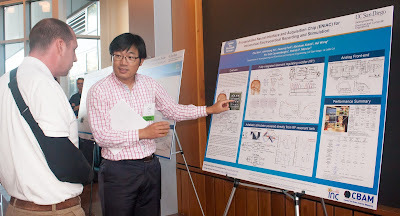 One of the speakers at the event was Professor Sheng Xu, who joined the faculty in the Department of NanoEngineering this past summer. Xu spoke about his research on developing new “soft” inorganic materials for advanced electronic sensors that can be comfortably worn on the skin. Faculty talks also featured presentations from computer science and engineering professor Tajana Rosing, nanoengineering professor Darren Lipomi, and electrical engineering professor Drew Hall. 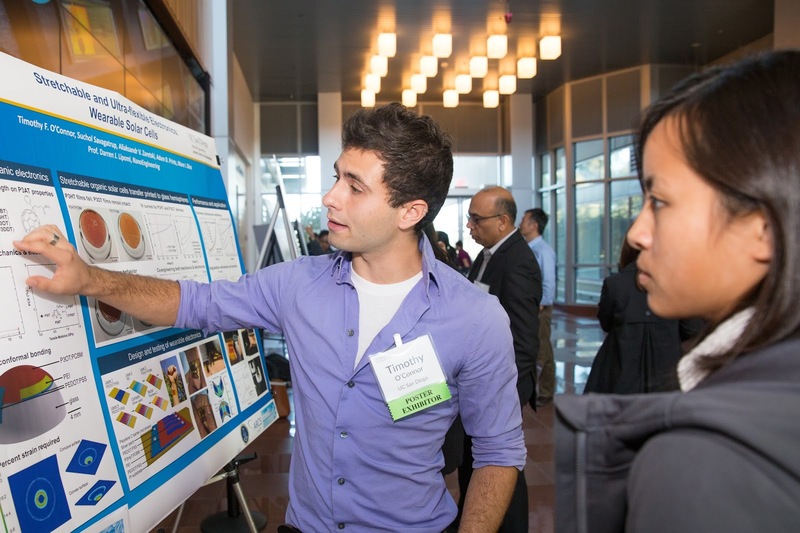 Student researchers showed off their latest work at the Center for Wearable Sensors (CWS) Summit. 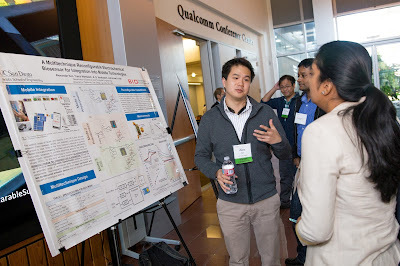 During the poster pitch competition, 12 students were each given 90 seconds to pitch their research to the audience and were evaluated by judges. 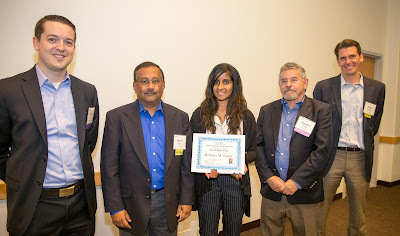 The first and second place awards went to Timothy O’Connor and Kirtana Rajan, respectively. 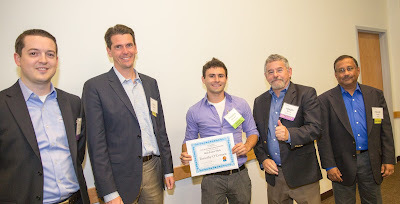 L-R: CWS Associate Director Patrick Mercier; Peter Simpson from Dexcom, a CWS member company; graduate student Timothy O'Connor, the poster-pitch competition first-place winner; Joseph Wang CWS Director; and Manish Nandi from Sabic, a CWS member company. L-R: CWS Associate Director Patrick Mercier; Manish Nandi from Sabic, a CWS member company; graduate student Kirtana Rajan, the poster-pitch competition second-place winner; Joseph Wang CWS Director; and Peter Simpson from Dexcom, a CWS member company. O’Connor pitched his research on ultra lightweight wearable solar cells, and Rajan pitched her research on electronic hand sensors that wirelessly translate American Sign Language gestures to text on a computer. Both students are members of Professor Lipomi’s research group. 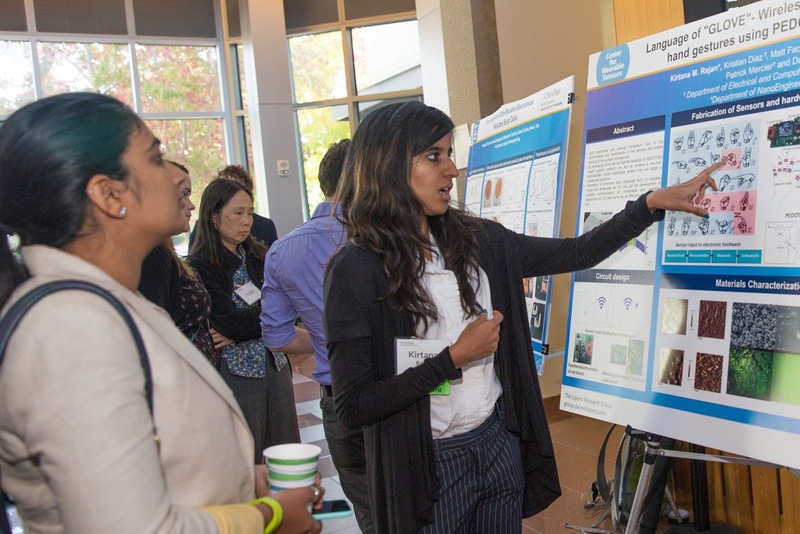 Attendees had a chance to learn more about these projects and others at the afternoon student poster session. Learn more about the Center for Wearable Sensors at UC San Diego.